If you’re like me, you probably have a propensity to collect “stuff”. While most of it has a purpose, there are a lot of items that need to be stored while not in use. 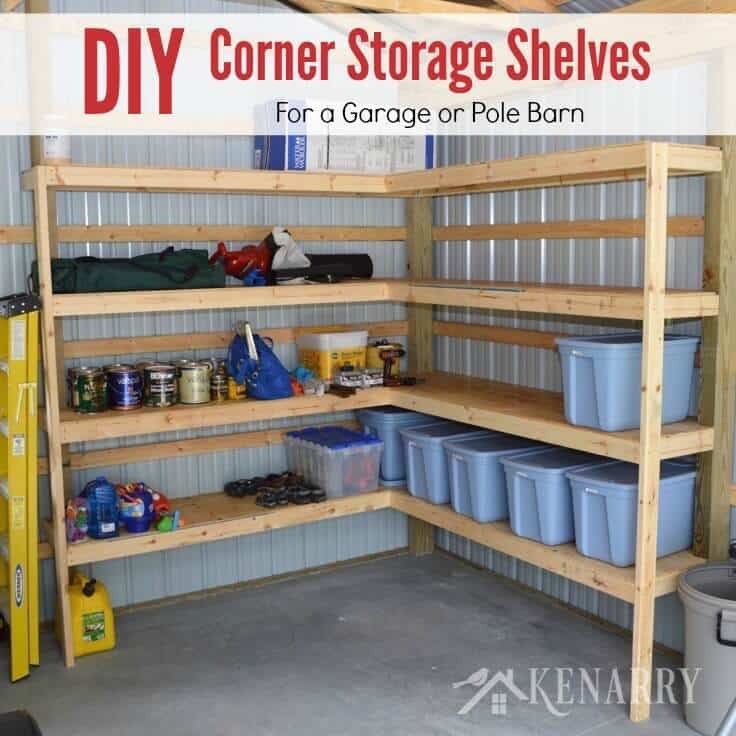 Today, I’ll show you how to make DIY corner shelves to create more storage space in your garage. 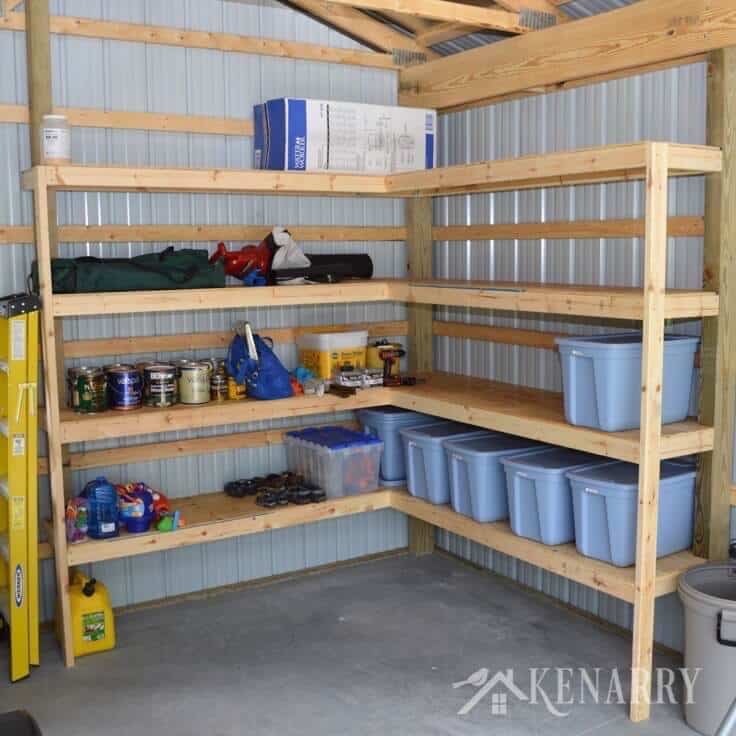 When Carrie and I put up a pole barn a couple of years ago, one of the main purposes was additional storage to help keep things neat and organized. I wanted to achieve this in a way that minimized the required floor space while maximizing storage. Another requirement was for the storage to be easily accessed, so rafter storage wasn’t going to work. My final solution was to go vertical and tuck the shelving tightly into the corner. As you can see from the pictures of our DIY corner shelves, I also went out of my way to avoid a support post at the crux of the L shape to maximize usable space. I hope you’ll agree that the end result was a lot of usable shelving space with minimal reduction of floor space. 4 ft. X 8 ft. Plywood Sheets – 15/32 in. I haven’t listed any material quantities since every project will be different. This DIY corner shelves tutorial will give you some basic ideas, but you’ll need to figure out quantities for your exact configuration. The shorter screws listed are just used for the joist hangers, everywhere else I used the longer screws. Just to reiterate, every project will be a little bit different, so my intent here is only to give ideas and get you started on the right track for DIY corner shelves. The process for forming the frame is pretty straightforward. 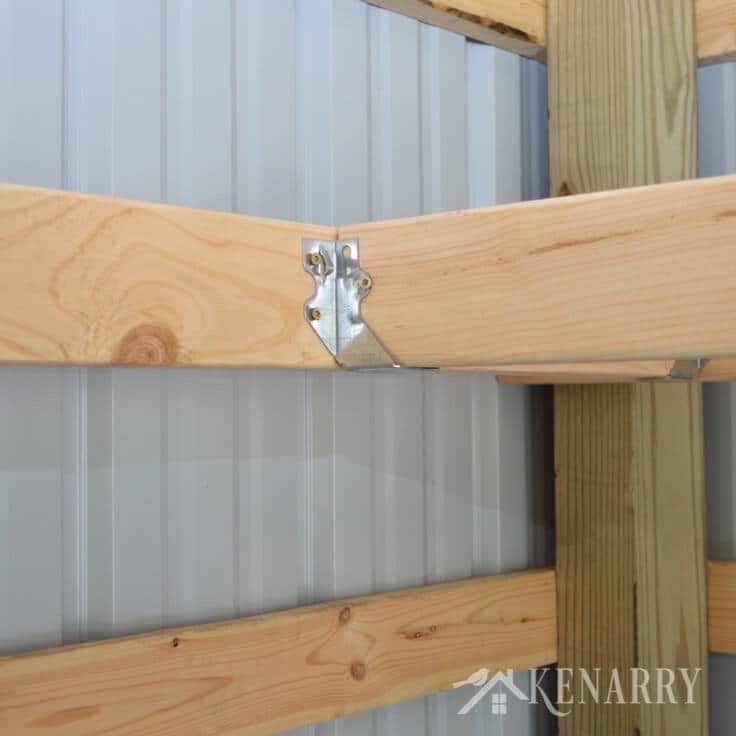 2 in x 4 in studs are used for both the vertical and horizontal shelf members. 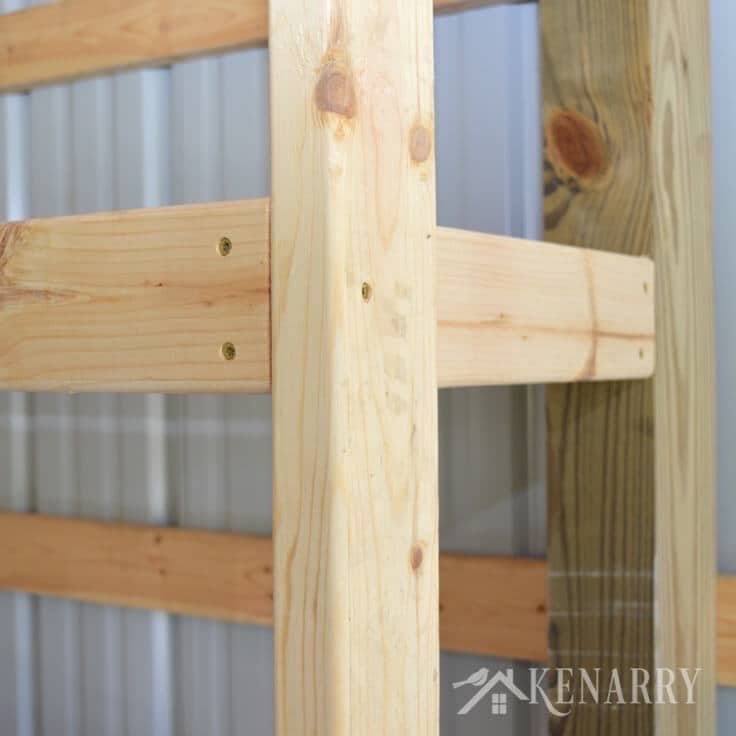 One key in reducing the cost for DIY corner shelves is to make sure that you use the existing posts from the barn itself rather than adding vertical studs to the back of the structure. The picture below shows how I was able to anchor to the existing posts. In fact, connecting to those posts will drive a lot of the dimensional requirements. Determine how many shelves you want. Now that you have a general direction for where to go with DIY corner shelves, it’s time to determine how many shelves you want. I chose to set the height of the shelving at 8 ft so that I could use full studs on the vertical members and avoid any cuts. I chose to go with four total shelves, the final one actually being the very top of the structure. I evenly split up spacing on the DIY corner shelves but then adjusted slightly so I could fit some taller items on the bottom. Once you’ve chosen the number of shelves, you just need to do a sketch of the frame of one of the shelving layers. From that sketch, make a materials list with the required lengths of each of the shelf structural studs. Remember, you’ll need to multiply the final number of structural studs by the number of shelves. Once you have that list, I recommend spending some time to figure out how to maximize utilization of the studs to avoid waste. If you’re brave you can make all the cuts at once for each shelf. This will reduce saw setup time. In my case, I did the bottom shelf first to make sure I was happy with it and then did all the cuts for the final three shelves at the same time. Below are some pictures showing how I joined different parts of the structure for the DIY corner shelves. Long deck screws were used to connect to the existing building post. Joist hangers were used in places that I could not get screws in from the back side. The shorter deck screws were used to attach the joist hangers to prevent the screw head from poking out the back side of the board. This shows a simple connection using two screws to hold the boards together. Wherever I had access I chose to screw through the backside of boards to make the connection. The actual construction of the framework went quite quickly as there isn’t a lot to it. 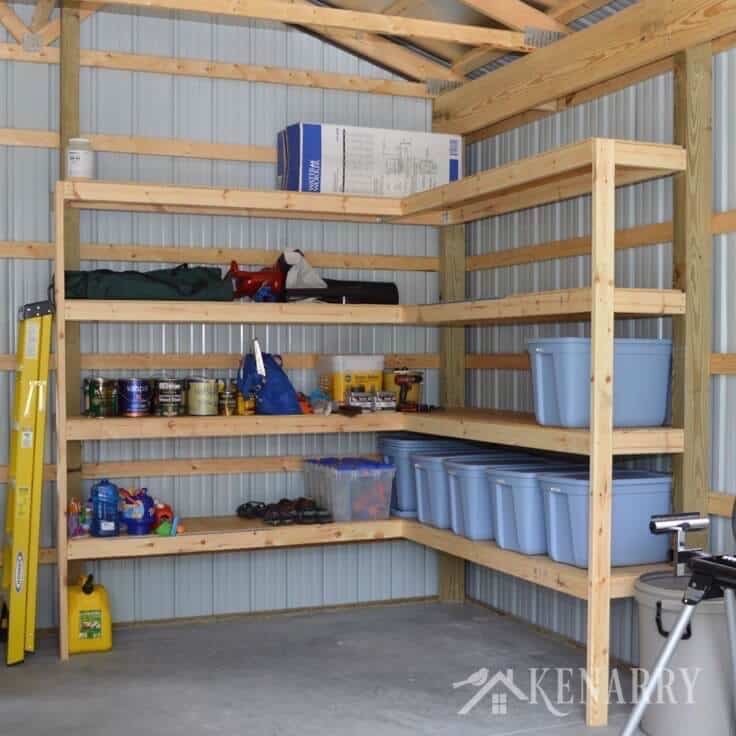 I need to reiterate that proper planning will save you a lot of headaches, so take the time to sketch out the key elements of your DIY corner shelves. Also, a level is your best friend in this process. Make sure that you are leveling each cross member as you put it up. 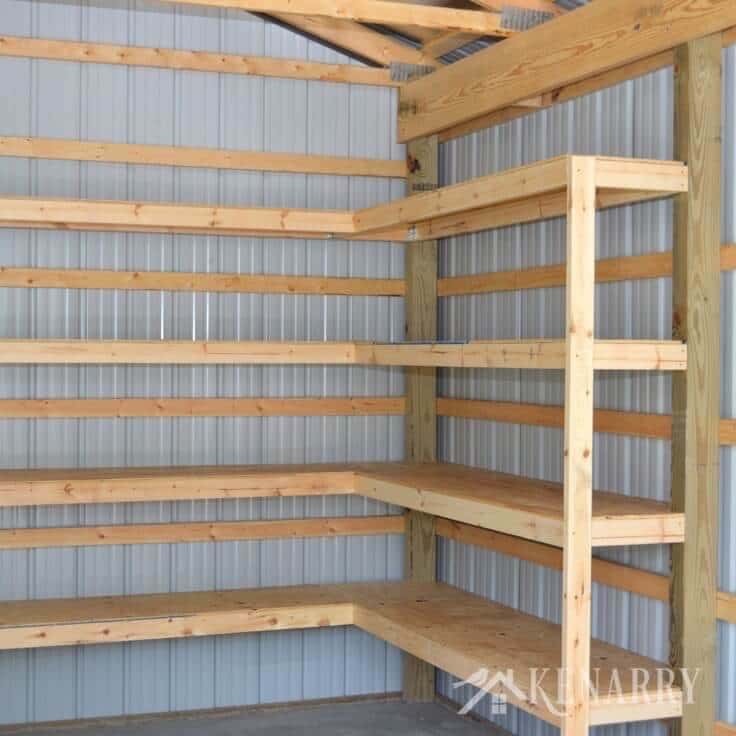 Now that your framing is up, it’s time to put on the shelving. Once again, I can’t overestimate how important it is to do a quick sketch and make sure you’re getting the best utilization from your sheet of plywood. I chose to use 15/32″ plywood for cost savings. Because I built a robust frame I was able to go with thinner plywood and save some money. Rest assured, once you have it in place and screw it down, it gives plenty of support. Below you can see the finished DIY corner shelves. Notice that I did have to notch out the corners in order to get the plywood to slide all the back to the metal siding. Once your shelves are cut, slide the plywood into place. Below you can clearly see the notch out to accommodate the post. The final step in the process is to strategically screw the shelving down to the frame. It doesn’t take many screws to secure the whole structure together. Once secured the plywood will stiffen up the entire DIY corner shelves assembly and you’ll have some seriously heavy duty storage! 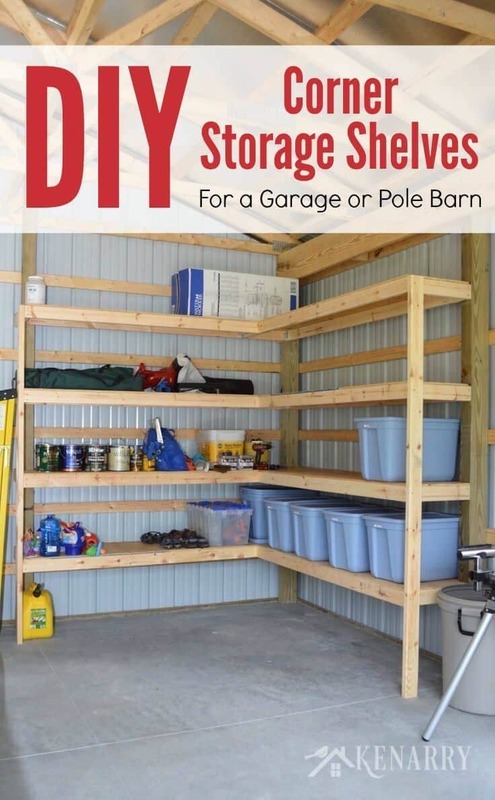 Congratulations, you’ve just created some great, out of the way DIY corner shelves for garage storage. 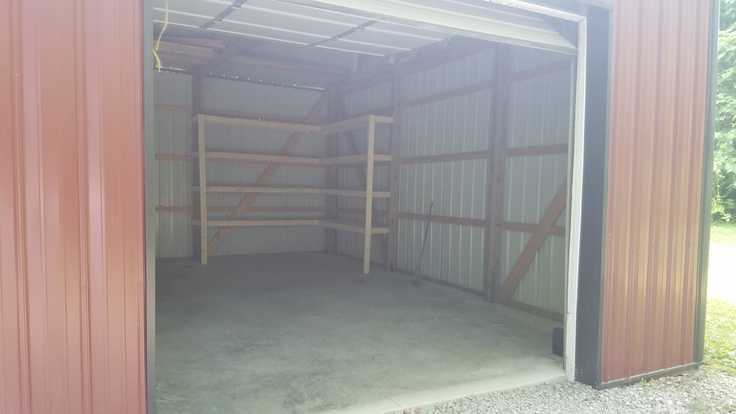 Now fill it up and enjoy your organized garage! What a clever way to save on much needed space. Thank you! It’s so useful for keeping that space organized. Thanks, Lorraine! Extra storage shelves are always useful, aren’t they? Hope you’ll come back and see us when you get a house. Very Interesting and seems easy to do! Shane, thank you so much for the invitation. I just stopped over to your blog to link up. Have a great week! Thank you so much for sharing this and your other articles with us at The Homesteader’s Hop! I really enjoyed reading them. I do hope to see you again this week. So glad you enjoyed this, Shane! Have a great week. Thanks for linking up over at Family Fun Friday. This is one of the posts I’ll be featuring this week. Oh yay, yay, yay! We’re thrilled you’re planning to feature our post this Friday. That’s such an honor for us. Thank you! I understand that affiliate links and programs are useful, but for new ones coming to the site, don’t buy these $3 joist hangars from Amazon. Lowe’s and Home Depot has this bracket for 75 cents. With 4 shelves, that’s a near-$20 difference. The special screws recommended here are top-of-the-line. Unfortunately, the article links you to a 5lb bucket of them (which is massive overkill), and Amazon seems not to have the 1lb bucket. Save another $30 and buy a pound (about 75) of the near-equivalent screw from the big-box stores. Again, kenarry people gotta eat, I get that. But these links push the line. Thank you for taking the time to comment! I understand the concern you’ve raised and wanted to give you a little background. When selecting links I try to remain true to product I actually used for the project. In this case, smaller quantities of screws that exactly matched what I used were not available on Amazon, so I chose to link to the larger bucket to give people the graphical representation of the products used. I do think adding some links for alternate materials that could be used and purchased in smaller quantities is a great idea and I’ll get right on that! Thanks again for your valuable input! 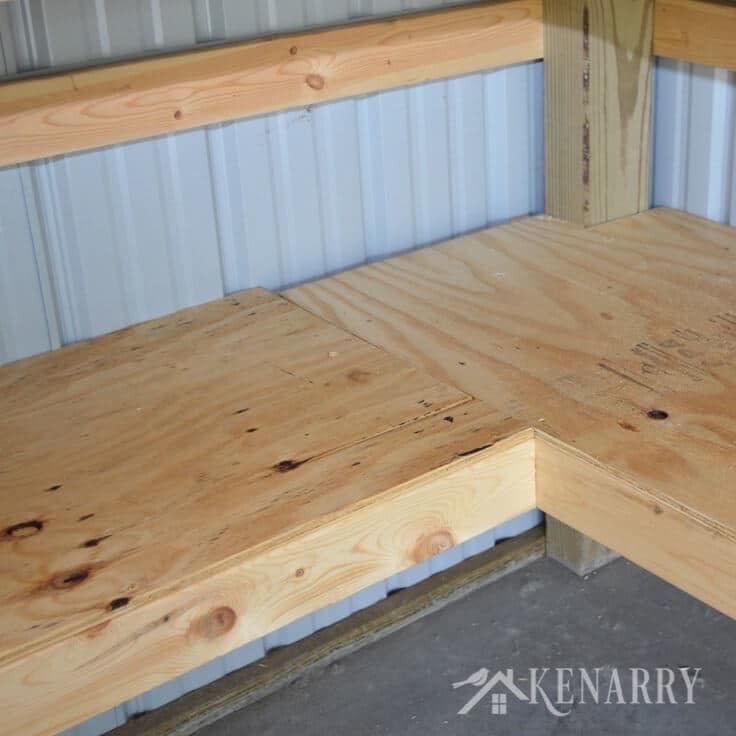 I’ve made shelves similar to this excluding the corners; could pocket holes be utilized similarly to secure ends of boards? I have a Kreg jig and it keeps most things very secure. I believe you’ll see decreased performance/load bearing with the pocket screws. In my instance I wasn’t concerned with aesthetics so I opted for long screws that went fully through the wood. That’s just a word of caution, if you do try it and find the results acceptable for your load conditions, please come back and share with us! I have been looking at a ton of storage shelving designs and this is one of the nicest open shelving units. I am very curious if you have a feel for how much weight the shelves can support without the addition of front center posts? Nice job! I can’t give a weight recommendation due to safety concerns and construction variation. In my particular case, I did not feel like the center post was necessary and have not had any issue with flexing and bowing of the shelves. Good luck with your project! I don’t see a number count for each of the items needed…how many 2×4’s are needed. How many hoist hangera…ect. Thank you for taking the time to read my article on DIY Corner Shelves. You are correct that I did not give specifics on lumber and hanger quantities. This was intentional as most implementations will be slightly different so I’d recommend sketching out your particular implementation to get the exact numbers you need. Just for reference, I used approximately five 8 foot 2X4’s and two hanger for each shelf level. I was able to use some of the scrap pieces on subsequent levels so my total was around eighteen 2X4″s and eight hangers. I hope that helps and good luck on your project! Thanks Curt! Sounds like your project is off to a great start. We’d love to see how your shelves turn out. 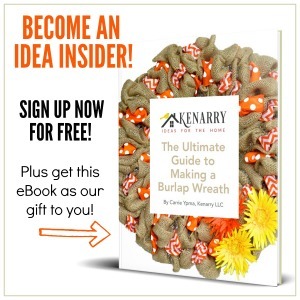 If you post a pic on Facebook or Instagram tag us @kenarryideas so we can check it out! I sent you some pics of the shelves I built! Thanks for the great idea guys! Curt, great job! I just shared the photos as a separate conversation thread to this post so the pics would be bigger for other Kenarry readers to see. Thank you so much for sharing them with us. 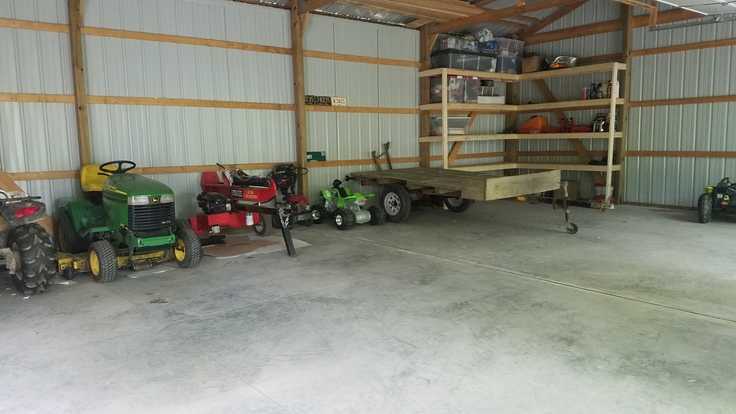 Enjoy filling your pole barn with useful equipment and fun “toys”, Curt! We’re so glad you allowed us to follow along on your building project. I am so glad I found this post! 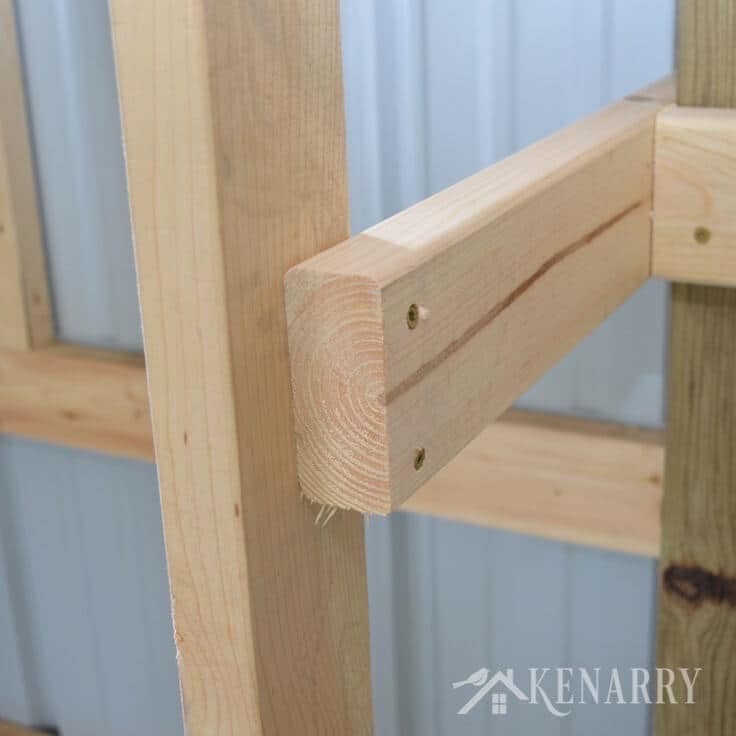 I have been trying to figure out how to build some L shaped corner shelves in my “post and beam” storage shed. The framework was the part I was trying to wrap my head around. I am definitely going to try this method. 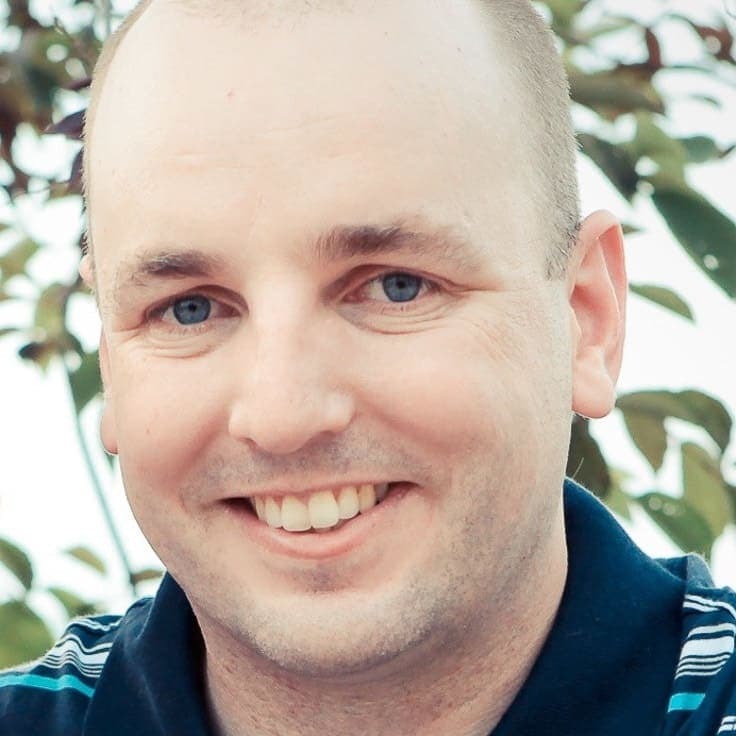 Nate, we love hearing that our project can help inspire yours. Hope the shelves in your storage shed turn out great. Let us know if you have any questions. This is exactly hat I want to Putnam in our basement for storage but couldn’t find it anywhere and couldn’t figure out how to have a structurally sound shelf that has “open” access in front. Will definitely replicate this! 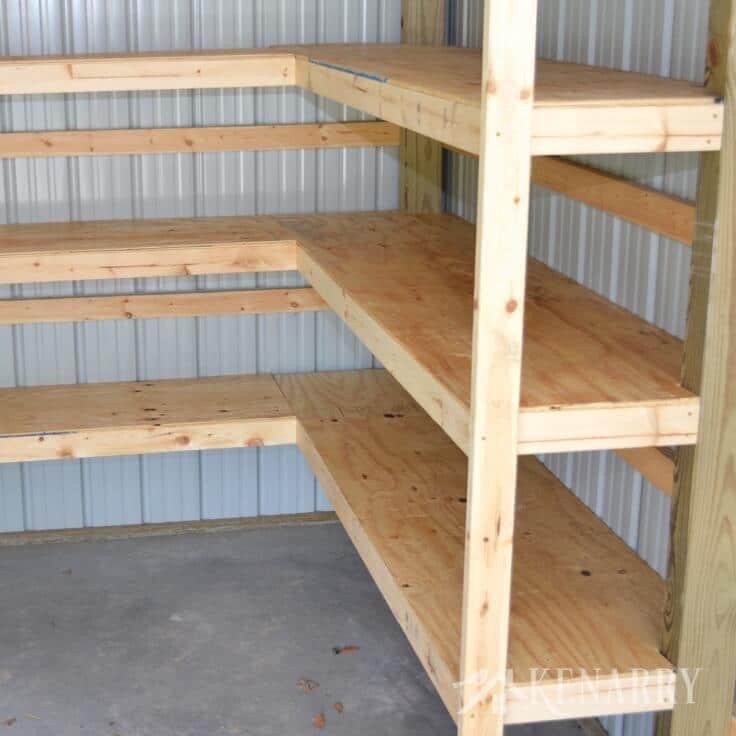 Could you please share the measurements of the shelf you built so I have an idea of size? I want to are sure I don’t make each shelf too long that they become structurally unsound. THANKS! I’m glad that my post on the corner shelves in my pole barn was helpful! 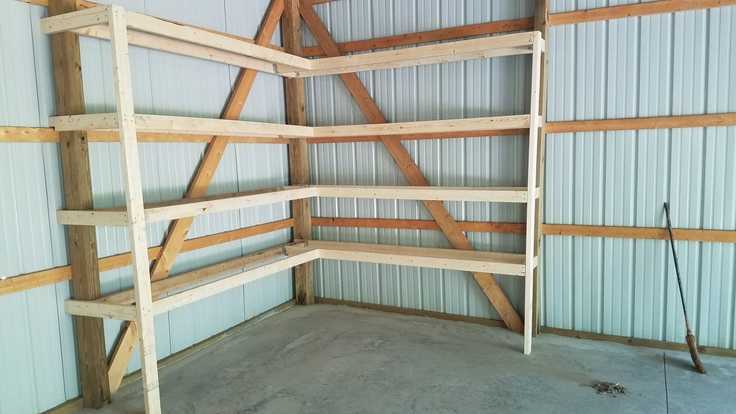 My longest shelf on the project was 96″ or 8ft which is a standard size for both plywood and 2X4’s and happened to match up well with pole barn posts. Best of luck on your project! I absolutely love this but I have a concern. 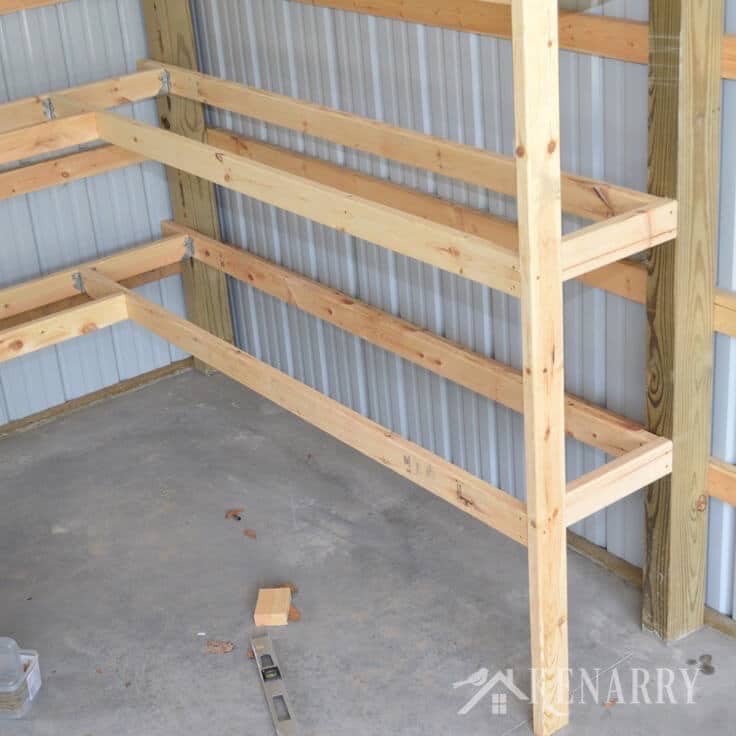 I am doing this in my basement and will not have the luxury of connecting the shelves to the structure as you did with your barn posts. 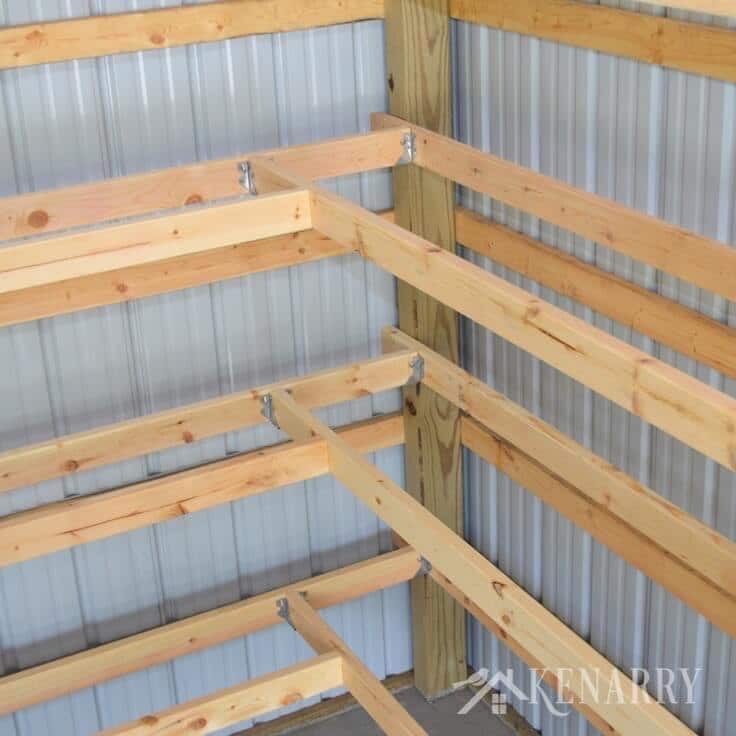 Will this still work if I just use 2×4’s in place of the barn structure? Meaning will it still be strong enough to be a legitimate tote storage shelving unit and won’t sag by the weight? Thanks for taking the time to reply on the corner shelves. 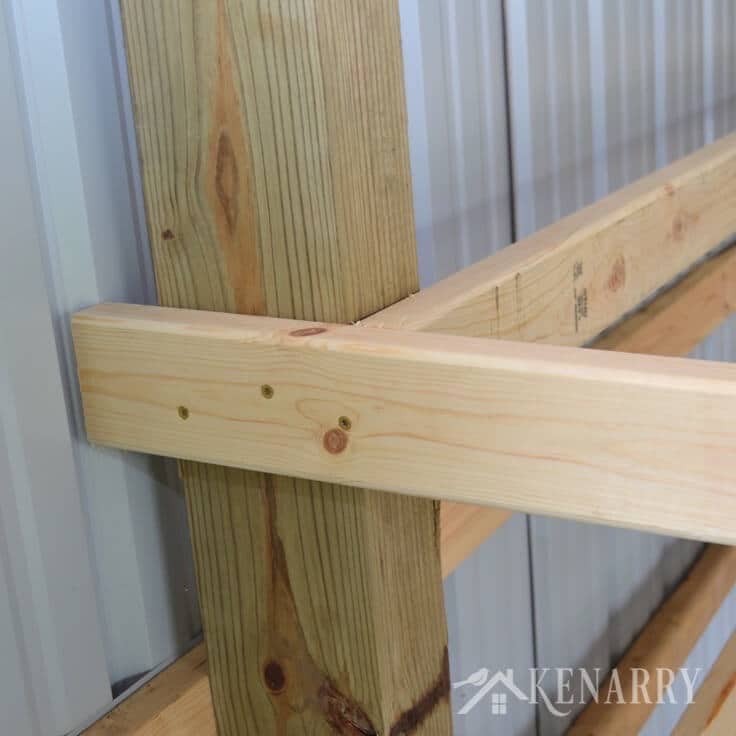 I personally don’t see an issue with replacing the barn 4X6″ posts with 2X4″ posts. Because the posts are vertical you’re loading them lengthwise in compression which I imagine will be pretty stable. My one caution would be to make sure you find a way to anchor it to the wall to prevent it from tipping since you won’t be attached to the actual building structure. Good luck on the project! What depth did you go with the shelving? My shelf width was just under 23.5″. I went slighty under 24″ to maximize the usage of the plywood sheets allowing for the loss of material from the saw blade. Hope your project turns out well!